In less than one year, Pakistan Youth Outreach has organized three expeditions as well as a training camp for boys and girls, all in the Shimshal/Mulungutti area. Pakistan Youth Outreach’s purpose and aim is to educate youth about mountaineering and the outdoors, to promote women’s adventure, and to explore the great adventure areas of Pakistan. After two previous, successful expeditions by Pakistan Youth Outreach, the third expedition was named the “Gender Equality Expedition” and the expedition was to an unclimbed, unnamed peak in the Karakorum, Gojerave area of Shimshal, Gilgit-Baltistan. Samina Baig, the rising female mountaineer of Pakistan marked her third 6000m peak in less than one year. Samina was the main focus of the expedition. She hopes to promote and inspire other females and to give a message that Pakistani females are as talented and strong as others. She hopes in the future to climb higher mountains and work for the cause and promote Pakistan Youth Outreach with her brother Mirza Ali. The main goal of the expedition team and the forthcoming documentary was not just a virgin summit. Samina hopes to inspire all women of Pakistan and around the world to be active participants in all fields of society. She says, “It is my intention to motivate more women to participate as this will give a message of confidence to females everywhere that if a young woman can climb a mountain, she can do anything.” The expedition was to highlight gender equality and to welcome all women in the extreme sports in Pakistan. Further, being part of Pakistan Youth Outreach, she wants to encourage more women in Pakistan to become involved in extreme sports and to represent Pakistan and its potential adventure areas, and also to support and encourage youth to explore Pakistan and its amazing mountains. The project was also to bring to the world the unique and rich culture of Shimshal, the most remote frontier village in Pakistan. Samina climbed Chashkin Sar, 6400m, in August 2010 and then became the first Pakistani woman to go on a winter expedition in December 2010. 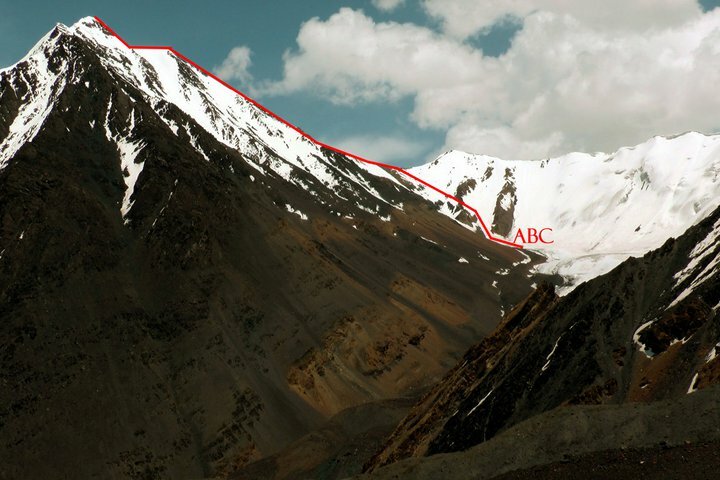 She retreated only 150m short of the summit of Mingligh Sar. She was unable to reach the summit due to hard and bad weather and insufficient equipment for the conditions. The Gender Equality Expedition started on June 19, 2011. The team consisted of Samina Baig, 20, Pakistani female mountaineer, Malgorzata Skowronska (Poland), climb leader, Mr. Christof Nettekoven (Germany), climber & photographer, Jens Franke, climber, Mirza Ali (Pakistan), Expedition leader, and Arshad Karim (Pakistan), climber. According to the plan to climb the unclimbed, unnamed peak in the Gojerave area, the expedition kicked after all required purchases and documentation with the Minister of Tourism were taken care of. The team hired 13 porters and two cooks a donkey:). 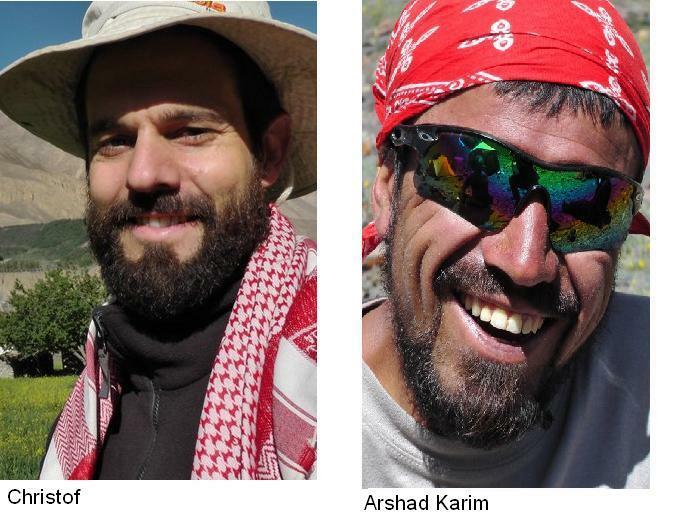 After three days trek, the team reached Boisum Pass, 5090m, and then proceeded to Perchod Washk where it was decided to continue further down since acclimatization was the issue. The team was happy to meet shepherds at Mindikishlagh. The shepherds welcomed the team and served them with local food and tea. In the evening, the team bought a big goat and decided to go back to Perchod Washk and put set up base camp. Perchode washk is 4580m , After lunch the next day, the religious man, Mr. Karim offered prayers over the goat for purification and also good wishes for the climb; the porters also participated in the prayers. Later the goat meat was distributed among the porters and also some to the kitchen of the expedition. In the evening, the porters arranged a singing session and invited the team. It was a fun time but was also short. The porters said good bye the next morning since the team had to stay for a week at the base camp for acclimatization and then the final climb. Everyone was feeling great. 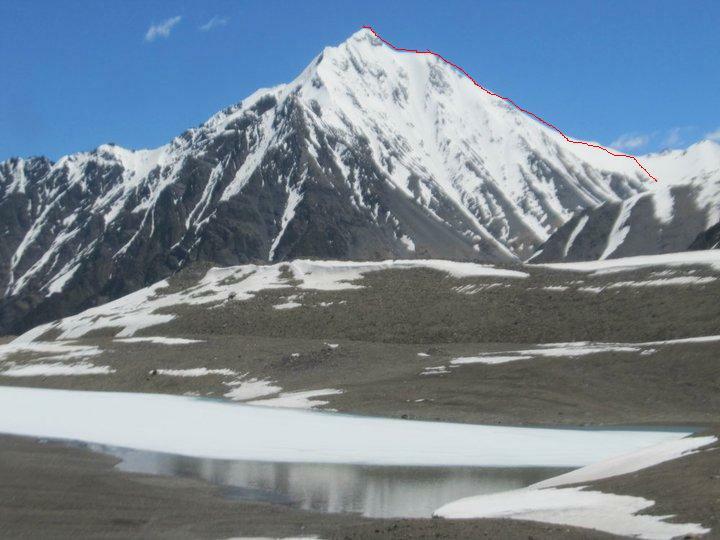 On 23 June, after breakfast, the team left for high camp for more acclimatization. It was new to explore the path to high camp, along the gorge, rocky and then icy portions finally led the team to high camp. 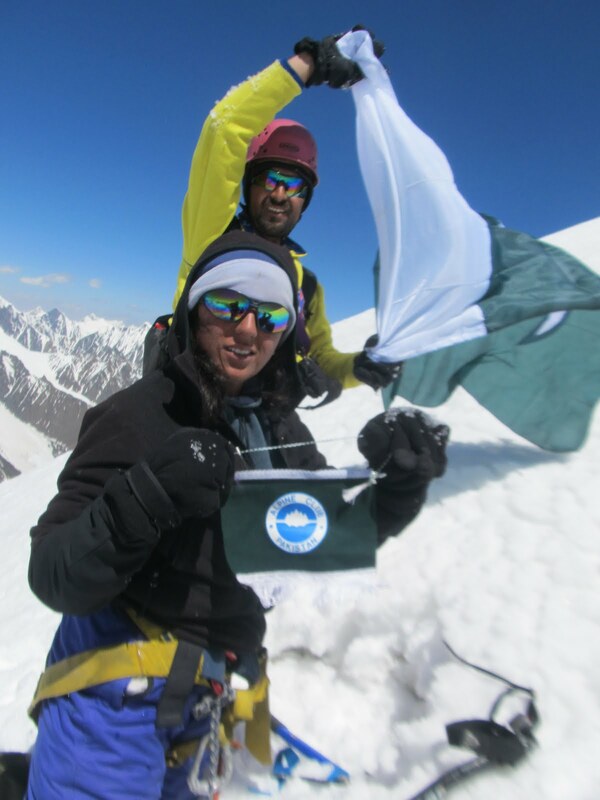 Samina Baig reached high camp first and piled stones on each other there. The other team members reached one after another and deposited the equipment and food at high camp. They then returned to base camp. It was a great acclimatization day and everyone was feeling great but were feeling tired due to the altitude. The high camp was shown as 5200m on Mr. Franke’s GPS. Upon arrival back at base camp, Jaffar the chef had very good fried meat ready. It was delicious and everyone enjoyed. After a nap, the team met at dinner and decided that a few still did not feel fully acclimated and wanted another acclimatization day to high camp. The time was set for 10:00 AM. Everyone packed up the next morning and left for high camp. Jens and Samina later dropped out and stayed at base camp with some small exercise and walks around the camp. Christoph, Malgorzata, and Mirza went up half way and then Christoph returned. 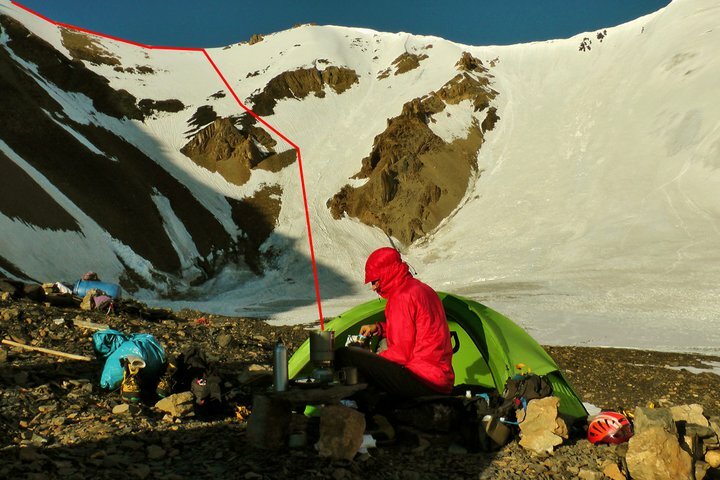 Malgorzata and Mirza went further, closer to high camp and then returned to base camp. 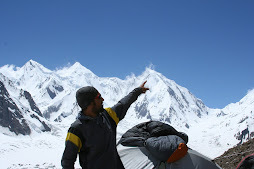 On 25 June, the team, ready and everyone feeling superb and positive, left at 9 AM for high camp. Dilbar Khan and Arif Baig were the porters to carry the tents and remaining food items. The team set up the camp site, leveled the ground and put up three tents. This was the first time to have set up a high camp on this virgin peak. After lunch, the porters left for base camp. The team had some chats and a little nap and then at 4:00 PM, Mirza and Arshad went for additional acclimatization at the ice arena whose altitude was almost 5500m. The snow was very deep and soft. They reached almost to the top but the snow was very soft and avalanche danger was a big concern so Mirza returned after reaching just 4m short of the summit. It was all deep snow and they just slid all the way down to high camp. The gloves and clothes were all dripping wet because of the heat and the soft snow. Luckily they did not have to deal with any avalanches! it was amazing that 100 to 200m of the climbers there was an avalanche the time they were going up, while Mirza was making the final pitch ,there was small avalanches.which was pretty scary for Arshad . but the decision was good to go safe. In the evening, dinner was prepared and some food items were distributed for breakfast. The temperature was not so cold. Malgorzata and Samina were served so Jens and Christoph prepared their food. The team held a meeting about the next morning for the summit push and it was agreed to start at 2:30 AM. The night brought perfect weather, the sky clear and full of stars. The night temperature was not so cold and everyone slept well. In the early morning at 2:20 AM, noise was heard from Jens and Christoph. Arshad also woke up and started with breakfast for two tents’ members. The breakfast was ready and Malgorzata was ready with her climbing outfit and entered the tent for her meal. Hot dogs, cookies, jam, bread, honey, and peanut butter were served to feed the climbers and also soup to give the best possible energy for the climb. The previous evening, it was agreed that since the route is unexplored, the team would be roped up on two different ropes. Mirza, Malgorzata and Samina on one rope and Arshad, Christof, and Jens on the other. As the team climbed higher, the views became more amazing and exciting. Getting to see huge mountains like Dastagir Sar, Kanjut Sar, Kunyangchish, Yukshingarden, all 7000m plus peaks was breath taking. The joy came to its highest point when the climbers saw K2 from the peak. It was standing tall at a long distance but with a very clear view of the summit pyramid. Jens has gone way too far and behind the scene while the rest of the team was going slow but with a good pace. The snow was getting deeper and softer. At the second middle portion, the team encountered a crevasse which was pretty deep. first Samina and then Christoph fall in to the crevasse but managed to get them out quickly. After the third portion of the steep part, there is a point where the summit was very clear and visible. Jens was near the summit, only 20 to 22m short of it which was the most dangerous part. The team stopped for a while for photography and water. Jens was a little angry and shouted that the snow is getting softer and better leave the photography for later. It was not sure if the final steep and dangerous part was possible to overcome. Jens below the summit, was sitting on a rocky part. Mirza moved to Jens and then decided to fix a belay point to belay one person that way and fix a rope to the summit. The summit had overhanging seracs and a very sharp edge to the top. Both sides appeared to have big avalanche possibilities. All the members moved to the rock part and Mirza Ali fixed the belay point and Malgorzata wanted to belay him. This section of the mountain was the hardest because of the soft and overhanging seracs. Mirza placed the belay point on the Rocky section ,which was pretty firm to hold any fall.. At one point, the team below the summit at the Sun Terrace thought they might not get to the top and return from the sun Terrace. However, Mirza led the section and fixed the rope to the top. Mirza cut the overhang with hammers and made a path to the summit. The summit was very dangerous, not a proper place to stand. Three directions had overhangs, the north, west, and east side. A minor mistake could have caused a disaster. After Mirza finished with fixing the rope, Samina marched her way to the top by jumaring and then followed by Christof, Arshad and Jens. Malgorzata was at the belay point so she came last after Arshad went to replace her. The joy of the summit was amazing and the team took lots of photographs. the Climbers hugged, felt the great success and freedom of summit . The members started to go down quickly as the snow was getting soft and giving a hard time. According to Christoph, Sträng said this year is the warmest temperatures in the Karakorum in the last 20 years. These temperatures made the snow soft and snow bridges over the crevasses broke and caused the team a hard time climbing. At one point, Mirza fell in a crevasse with one leg and the rope was helpful to pull him out. At some points, the snow was waist deep. The team had a safe descent until Samina slipped on a steep slop Malgorzata was in front of her ,she was quick with Ice Axe, to control the fall. though it was quick stop of samina fall. later it was noticed that Arshad had unroped and slid down to high camp on his own and left the rope ,, during the descend at the last portion of the slop, Mirza left foot stuck in the deep, soft snow, it was so bad almost to break the leg, but Malgorzata showed her another good feat, and removed the snow and released the leg. few minutes later Christof fell in to a crevasse; a soft snow bridge did not hold and he went 3 to 4m in the crevasse. Malgorzata and Samina were behind Christoph and Mirza at the side hold him. Malgorzata and Samina did pretty well to control Christof from going further deep in the craves. The fall happened near the foot of the mountain, only about fifteen minutes from high camp. The snow was soft however Malgorzata and Samina were able to hold Christoph firmly. 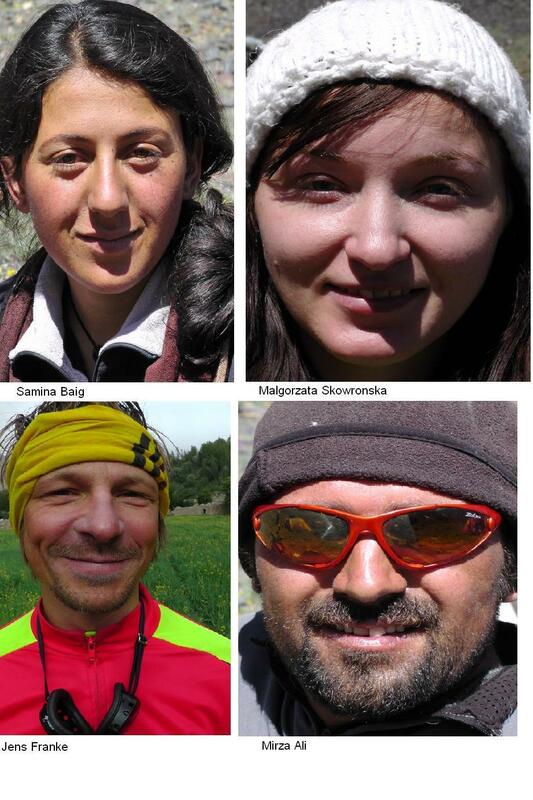 The porters had just arrived at camp so Malgorzata and Samina shouted and called for help. Dilbar, Arif, and Arshad came with a new rope and Christof was rescued after about fifteen minutes. Luckily there were no injuries. After rescuing Christof, the team was so relaxed and thanked God for the safe ending. At high camp every one greeted and Christoph announced sheep to sacrifice! The porters had some nice food for the climbers: tea and lunch, and then packed to leave for base camp. Mirza, Malgorzata and Samina went faster so all caught up later at base camp with joy. Nice fried meat and french fries welcomed the climbers back. The sheep was brought and cut to celebrate the success. The team then moved back to Shimshal after two days. Samina’s family was so happy and came to greet her with lots of congratulations. After the summit, the team decided to name the mountain local name – Kohi Brobar (Mount Equality) 6008m. The base camp was named Samina Camp and the ice arena that Christoph liked will now be called the Samina Arena. The final step of the mountain is named the Mirza Step, below the summit a large plateu ,christof liked to name it “Sun Terrace” the crevasse Christoph fell into has been named German Fall and the route has been named the Malgorzata Route “Mirza Proposed” since it was her first 6000m summit. Mr. Franke had a GPS unit that showed the mountain’s height is 6008m. The climbers started at 3:30 AM from high camp, the foot of the mountain at 4:00 AM, and reached summit at 11:00 AM. The German Fall happened at 12:35 PM and the team arrived back at high camp at 1:30 PM. It took approximately 10 hours for the full climb and return. The summit view was incredible as all the high mountains were visible including Batura I & II, Shispar Peak, Ultar Peak, Lopghar Sar 7200m , Momhale Sar, Traver Sar 77, Dastaghir 7885m, Kanjut Sar, White Horn Shimshal, Yazghail Sar, Yazghail Dom 7300m, East, Yukshin Garden 7500m and the massive K2. There were also a huge number of mountains up to 6000m yet to be climbed and named. the Expedition was very much successful however deep and soft snow due to warmest temperature in the karakorum in 20 years made the climb harder, the swedish climber Fredrik Strang says in his post from Nanga parbat "warmest temperatures since 20 years" here is what Sträng stated: "Nanga Parbat is over. In camp 2 (6200 m) i decided to turn back. Constant bad weather (permanent avalanche danger) for 1 1/2 months, winds, snow, lightning and extremely dangerous rockfalls due to the warmest weather in 20 years makes such an decision easy. Samina Hopes to continue her climbs and reach summits of Mount Everest and K2 as the technical skill is gained! and so the support and sponsor! Special thanks to christof ,Jens franke, Malgorzata, and the entire team of porters, cooks and Arshad and of course Miss Donkey, for making the Expedition wonderful. Samina Baig, Malgorzata and Arshad climbing the middle section of the mountain. Absolutely amazing!! The photos, the mountains and most importantly, the message. Beautiful!